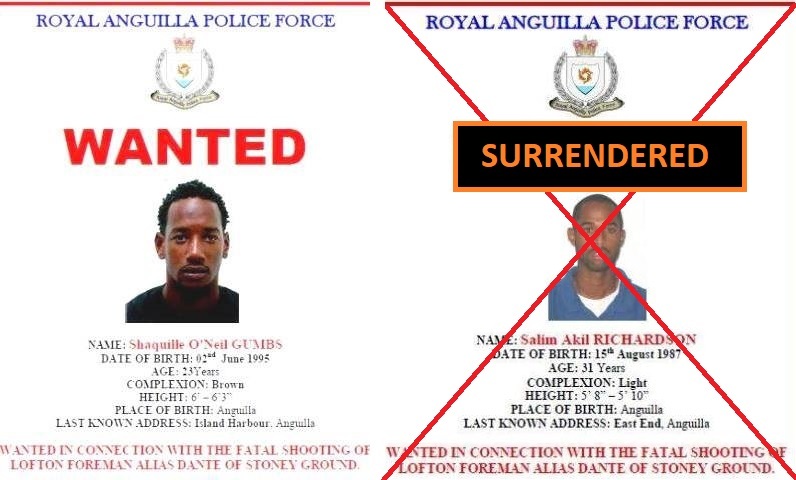 ANGUILLA — The Royal Anguilla Police Force reports that at 9:30am on Friday 9th November, 2018 Salim Richardson of The Copse, East End voluntarily surrendered to the police at The Valley Police Station accompanied by his lawyer Michael Bourne. As a consequence Mr. Richardson is no longer wanted by the police. However as the police continue its effort to locate Shaquille Gumbs who is also wanted in relation to the ongoing investigation we would like to inform the general public, that it is an offence to harbour a person that is wanted and known to be wanted by the police. Any person or persons found harbouring Mr. Gumbs may be prosecuted. Anyone having information about the whereabouts of Mr. Gumbs are asked to call the Valley Police Station and speak to an officer from the Major Crimes Unit or any officer of their choice. Additionally information can be sent via the RAPF Tips Website by logging on to www.gov.ai/911which is a secured website.